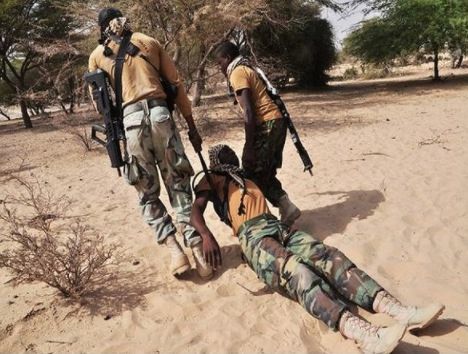 A Nigerian Army Captain who is depressed over the sad treatment of soldiers fighting Boko Haram in the North East has cried out to President Muhammadu Buhari to come to their aid. "I am crying out to the president, the Senate & COAS to see reasons for hastily treatment of troops who put their lives to defend this great country. It would surprise every Nigerians and the President that soldiers who were wounded in the fight against the ongoing insurgency are still lying helpless in the various military hospitals. As I speak to you, I was wounded in the fight 2014 and up till now, I am still laying in the hospital without my surgery, reason been that, the Nigerian army claim there is no money for our treatment for now. Each time I set my eyes on other soldiers crying under pains, using regretting words for their effort not considered, I wept. How can the Nigerian army authority be this wicked? Most of us with surgical issues came in here for over years, as usual in the military, a medical board was done with an outcome of a total estimate of our surgery some as low as two hundred thousand and above but we would be left without the surgery for years and we ask the medical director, we were shocked to be told that, the army headquarters have not approved it and something have not released money for our treatment. I know on seeing this, the Nigerian Army would deny it but I am asking the president, members of senate and well meaning Nigerians to visit the following military hospitals to see this for themselves. 7Div medical hospital Maiduguri, Teaching hospital Maiduguri, 68NARH Yaba, Lagos state, 44NARHK Kaduna state and 2Div medical hospital. This has brought so much fear to most of our colleagues in the theatre of war, because each time we tell them situation we are going through, they responded with panic and advise to trade with caution. I am using the medium to invite people concern to please treat us as heroes and not criminals. Gos bless the president, the senate, COAS, and Nigerians."